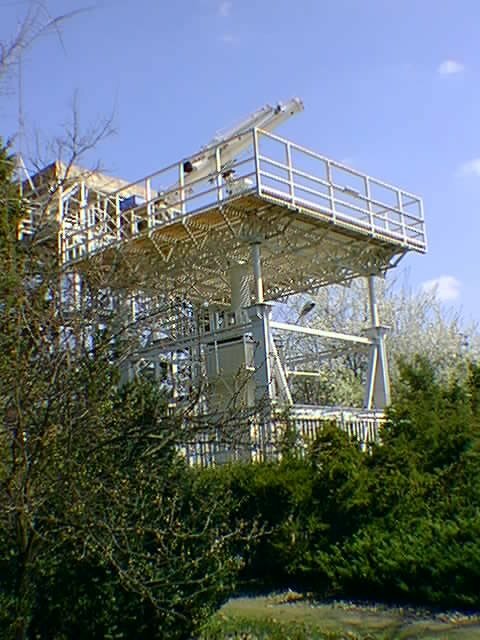 The observing facilities of the Observatory have been closed in 2016. Debrecen Heliophysical Observatory conducts scientific research in the fields of solar activity, heliospheric processes and solar-terrestrial connections. It works at the headquarter of the ATOMKI at Debrecen after closing its buildings and observing facilities in 2016. The DPD team continues the publication of sunspot databases based on the space-borne SDO/HMI data and based on the observations of the cooperating ground-based observatories. Hungarian forerunners. The start of Hungarian solar physics is connected with two outstanding personalities, Miklós Konkoly Thege and Gyula Fényi. Konkoly made graphical full-disc observations between 1873 and 1919 in the Ógyalla Observatory (today Hurbanovo, Slovakia) founded, built and directed by himself. Besides this, he also dealt with variable stars, stellar spectroscopy, geomagnetism and meteorology. These disciplines reckon their domestic start from his activity. Moreover, this incredible versatility is only the scientific side of his extraordinary personality, the richness of the spectrum of his further interests is also legendary. He founded the first Hungarian astronomical observatory in 1899 by a contract with the Hungarian state (actually, the first Hungarian research institute in state property), its inheritor is the Konkoly Observatory which belongs today to the Hungarian Academy of Sciences, our observatory is the solar department of the Konkoly Observatory. The centennary of the foundation of institute was celebrated in 1999. The other outstanding personality, Gyula Fényi (born as Julius Fink in Sopron, 1845), directed the Haynald Observatory at Kalocsa in the period 1885-1913 as a member of the Societas Jesu. He was mainly interested in prominences, he gathered and evaluated an enormous material with his prominence spectroscope, he published the results in the best journals in six languages. Other persons (as e.g. Schreiber) also gathered full-disc white-light observations which belong to the best quality materials of this era. Konkoly and Fényi accomplished very significant works even in international terms, their legacy - enormous observational material and lots of publications - is very valuable. Their names are preserved by lunar craters. The digitized Ógyalla and Kalocsa material is accesible at the site of Hungarian historical solar drawings. History in Debrecen. The Hungarian solar physics has been re-vitalized in the Astronomical Insitute at Svábhegy, Budapest in 1946, by establishing the Solar Department. The department moved to the educational observatory of the Kossuth University, Debrecen which was located in the Botanical Garden of the university and a new research institute came into life under the directorship of Loránt Dezsõ named Heliophysical Observatory of the Hungarian Academy of Sciences. The original building of the observatory has been enlarged and photoheliographic observations have been started on a regular basis. One of the photoheliographs has been moved to the Gyula Observing Station built atop of the water tower of Gyula (a town about 110 miles from Debrecen), which yielded twofold advantages. 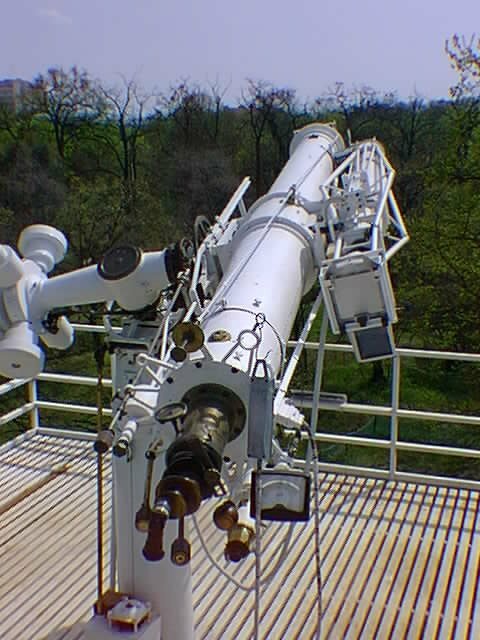 On one hand, there is only a single solar telescope in the world (Mount Wilson 150 feet), whose coelostat is farther from the ground level than the Gyula telescope (43 m) which is of basic importance for the image quality. On the other hand, we have about 50 additional observing days yearly. Significant developments have been made in the observatory in the beginning of the seventieths, the building has been enlarged and a big coronograph has been erected. A spectrograph and a Lyot-type H-alpha filter belong to the instrument. 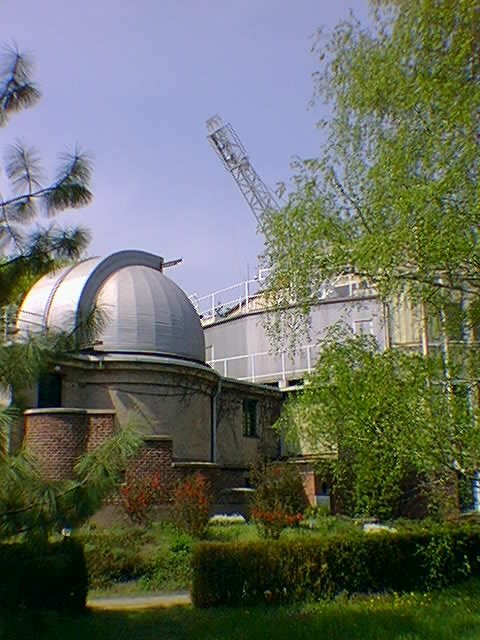 The observatory has been attached to the Konkoly Observatory in 1980 as its solar department. The photoheliograph observes the full disc of the Sun in the continuous visible light photographically ("continuous" means that not in a specific wavelength, but in a reasonably broad wavelength range). The observations - the photoheliograms - contain the photosphere, the surface layer of the visible hemisphere of the Sun with its structures, the granular network, the sunspots and the photospheric faculae. 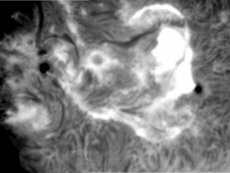 Photoheliogram-serii are made on a daily basis (if weather allows), on which the position and area of each spot can be determined. The position is defined in terms of the heliographic coordinate system of Carrington, which is divided into (+90)-(-90) latitudinal and 360 longitudinal degrees, like the geographical system, and rotates with the mean surface angular speed of the Sun. The traditional research profile of the observatory is connected with these sunspot positions because the Debrecen position data have admittedly the highest precision: about 0.1 heliographic degrees. This parameter is usually about 1 heliographic degree in other observatories. This precision is based on a methodological background developed in the course of decades, which is a powerful tool to eliminate the systematic errors. The sunspot positions are important data in investigations concerning those topics in which morphology of the sunspot groups and proper motions of spots are significant factors. Such themes are: structure of the solar rotation, connections of flares with the rapid mutual displacements of spots and their shearing displacements with respect to the background magnetic fields, dynamics of development and decay of sunspots and their relations to the development of the magnetic fields, morphological asymmetries of sunspot groups, orientations of the sunspot groups axes (a possible indicator of the subsurface velocity fields), torsional osciallations of spots. 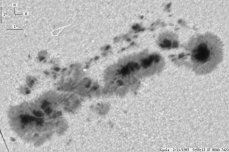 Possible applications of the sunspot areas: modeling of irradiance-variations, structural features of magnetic fields, decay rates of sunspots, etc. Images: the photoheliograph in Debrecen and its house. The most important task, even destination, of all observatories is to gather long-term homogeneous observational material about those phenomena for which its instruments are most appropriate. Considering that many phenomena reveal themselves in long timescale, their study would be very difficult or even impossible without long-term homogeneous materials (not only in astronomy but also in geophysics, meteorology etc.). The Greenwich Photoheliographic Results (GPHR) is the classical photospheric database, its volumes between 1878 and 1976 contain the positions and areas of sunspot groups for all days. The impact of the series was very significant, a big amount of analyses and publications were based on it. Similar databases are recently provided by the members of the SOON (Solar Observing Network: Holloman, Learmonth, Ramey) as well as Taipei. The program Debrecen Photoheliographic Results (DPR) started after finishing the photoheliograph program in Greenwich. The original aim was to compile a more detailed and precise catalogue than any previous attempts which would have also contained the magnetic polarities of the spots besides their positions and areas. However, the program proved to be extremely time consuming and laboursome and, as it was being carried out by two scientists, a significant delay was produced in publishing the catalogue. Otherwise, the produced volumes contain the most detailed informations from the spots and spot groups, they are accessible at the ftp service of the observatory. The Debrecen Photoheliographic Data (DPD) program was prompted by the mentioned delay. The co-workers not involved in DPR started a new catalogue which incorporates all data which can be reduced from our photohelograms, i.e. the precise position and area of each spot for all days, but not the magnetic polarities received from other observatories and the identifications of the single spots from one day to the other, because these are extremely labour-consuming tasks. The main aim is to eliminate the accumulated delay within a reasonable period. For this reason, significant methodological developments have been carried out under the supervision of Lajos Gyõri, which automatize the major part of the work, this development is recently under way. The produced DPD materials are accessible in our ftp service. A limited amount of printed version is also published (exclusively for exchange of publications maintained with observatories and institutes) and the most detailed version is published in The Journal of Astronomical Data (JAD) which also contains the fits images of the active regions with the identifying numbers of spots, these materials are also accessible at our ftp-site reproduced from JAD 6, 1 (2000) and JAD 4, 2 (1998) with permission. The Hungarian Historical Solar Drawings (HHSD) database: Considering that the historical observations made in Kalocsa and Ógyalla between 1873 and 1920 cover a 48-years period, and the Debrecen photographic material (nearly two hundred thousands plates) gathered between 1958 and 2000 cover a further 43 years period, so the Hungarian full-disc observations cover a total of 101 years. This is the second longest photospheric material worldwide which ranks among the best materials also by its qualities. This unique position compels us to initiate a catalogue which contains one digitized solar full-disc image in fits format for all days when such observation was made anywhere in the world. Until September of 2000 the digitization of the Kalocsa material has been completed with the help of the Hungarian Science Foundation and the millenial Cultural Heritage Program. Right now, the reduction of the raw data and the organization of the necessary international cooperation is in progress. The importance of the material is convincigly demonstrated by this figure comparing the information content of the numerical data of the Greenwich table and the original observation taken at Kalocsa. The phenomena of the solar chromosphere can be studied with the coronograph of the observatory and the attached H-alpha filter. It is worth mentioning that the original ideas of both instruments were put forward by the brilliant French astronomer, Bernard Lyot. The coronograph was designed by G.M. Nikolsky in the former Soviet Union, several similar instruments are in the successor states of the Soviet Union as well as in Wroclaw, Poland. Its objective is a single lens of 53 cm diameter and 8 meter focal length, the effective focal length is 12 meter by means of an auxiliary optical unit, so the observed diameter of the solar disc is about 12 cm. The role of the coronograph design is to minimize the amount of the instrumental scattered light which is the main obstacle to observe the solar corona. As the other - the atmospheric - source of scattered light can only be diminshed on high mountains, the Debrecen Observatory will never be able to conduct corona observations, but the low level of instrumental scattered light is an important requirement also in chromospheric observations. 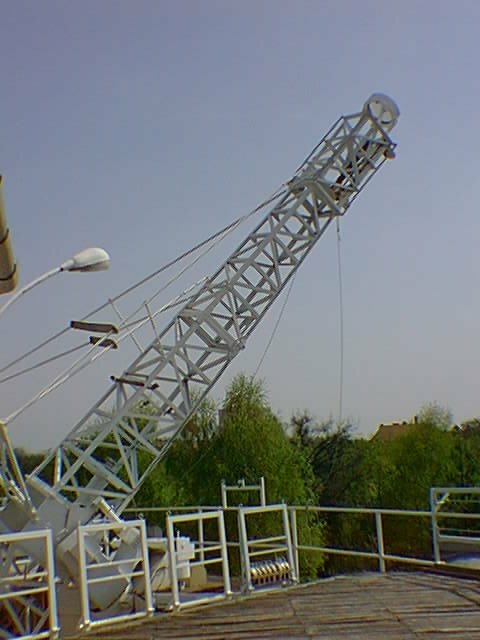 The optical properties of the instrument are excellent, but it is very difficult to make work the cumbersome mechanical construction, so it can be operated reliably only under quiet meteorological conditions. The H-alpha filter is called also birefringent filter or polarizing monochromator as its essential part is a set of polarizers and birefringent chrystals. If the light passes the filter, the output is a 0.5 Angström range of the light of 6562,87 Angström wavelength. This wavelength belongs to the strongest member of the Balmer series of Hydrogen, if we observe in this wavelength we see those events in which Hydrogen is involved in the solar atmosphere. The main aim of these observations is to study the solar flares. The rapid energy release in the course of a flare causes a local enhancement in the temperature and the intensity of radiation of the active region within a relatively short time, which can be registrated through H-alpha filters. Our observations are usually connected with coordinated international observing campaigns. The public interest is very high toward solar activity because these are the most influential astronomical phenomena onto the terrestrial environment. However, it is very difficult to detect these effects and to reveal the underlying mechanisms in the lower atmosphere because the solar effects get through several modifying domains. The activity of the observatory is related to the studies of solar tropospheric relations by two paradigms. The most popular paradigm holds that the tropospheric phenomena are influenced by the variations of the solar irradiance which is closely related to the coverage of solar surface by sunspots. These studies are supported, among others, by the sunspot area dataset provided by the photoheliograph program. The other paradigm of solar-tropospheric studies is quite new and it considers the impact of the variations of corpuscular radiation. These impacts have been investigated for a long time in the magnetosphere and upper atmosphere, but not in the troposphere and in this domain our observatory managed to achieve a step forward. Several magnetic polarity rules have been pointed out in the atmospheric responses which make unambiguous that the effects transferred by the particles (the magnetized solar plasma) can effectively influence the tropospheric processes. A summarizing talk has been delivered in Tenerife at the first SOLSPA Euroconference in September 2000.